WACO — After walking off to two 6-5 victories last week, Texas was forced to watch as Baylor celebrated the same accomplishment on Friday night. Davion Downey singled home Austin native Richard Cunningham in the ninth inning of Baylor’s 6-5 win at Baylor Ballpark. The loss was the fourth in Big 12 play for Texas, which participated in a non-conference series against Xavier this past weekend. Picked fourth in the conference’s preseason poll, Texas (20-13) is now 3-4 in its Big 12 games. Locked in a 5-5 tie, Texas called Matt Whelan out of the bullpen to start the ninth inning. The sophomore quickly worked a 2-2 count on Cunningham, a 2014 graduate of Austin High. But with UT shifting third baseman Ryan Reynolds to the right side of the field, the left-handed Cunningham placed a bunt on a high offering from Whelan that trickled to the vacated part of the infield. Cole Quintanilla replaced Whelan and walked the first two batters he faced. One out later, Downey ended the game with a single past a UT defense that was using five infielders. The game-winning hit was the 10th of the night for Baylor (22-7; 6-1). For its part, Texas produced nine hits and walked six times against a Baylor team that committed three errors. The Longhorns, though, stranded nine runners on base. Texas filled the bases in both the sixth and eighth innings but failed to score in either instance. In the sixth session, Ryan Leckich fanned UT senior Michael McCann to escape the jam. McCann later grounded into a bases-loaded double play in the eighth inning. Freshman Eric Kennedy was also thrown out twice due to a lack of awareness on the bases. The second base-running blunder cost UT a second-inning chance to have runners at second and third base with Austin Todd, the line-up’s No. 3 hitter, at the plate. Ranked 12th in the D1Baseball poll, Texas was coming off a 9-6 loss to Texas A&M on Tuesday. Following the stumble against the Aggies, Texas boasted the same 20-12 record that it held at the 32-game checkpoint of the 2017 and 2018 seasons. Earlier in the week, McCann was asked about his assessment of the team. Around the bases: Texas senior Masen Hibbeler’s first homer of the season was a two-run shot in the second inning. Texas led 4-0 after that frame. … Over 6 1/3 innings, Bryce Elder gave up five earned runs and eight hits. The Texas sophomore had surrendered eight earned runs over his first seven starts of the season. … After committing six errors over its previous three games, UT did not have a defensive mistake on Friday. 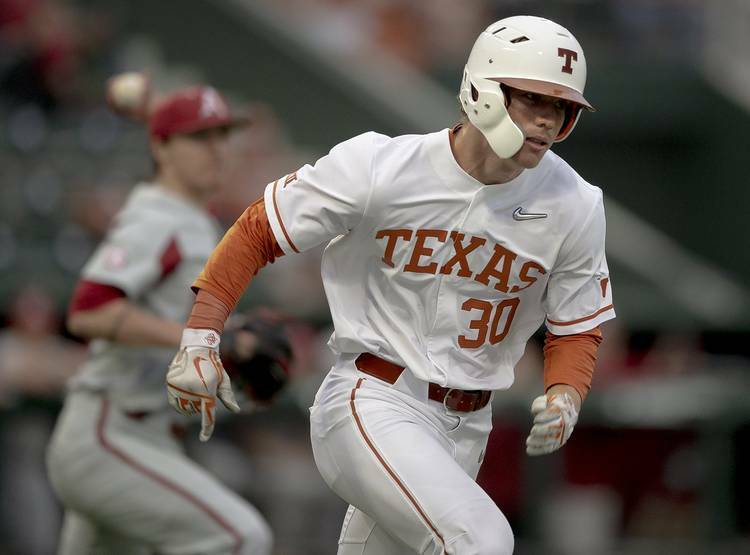 … Texas played three different players — Sam Bertelson, Zach Zubia and Tate Shaw — at first base on Friday.